We stood in the darkness on Schurz highway 95 about 10 miles south of Fallon, Nevada awaiting “The Pony”. Arriving about 1:30 am, we brushed and saddled our horses as soon as we got there. They were settled, munching on hay while we chatted about the logistics of the ride ahead of us. Soon another vehicle pulled in, it was the HAM radio operators. We talked with them and decided that they would follow behind the rider at a distance, as they could communicate on the remote 32 mile section of the Pony Express Trail. We were all experienced riders, and very comfortable with our horses, but it was still nice to know we had a safety net behind us in case we needed help. As we were talking, I saw a dim light appear on the eastern horizon. “There they are!” I said pointing to the light. A moment later, the lights of a vehicle also came into view and excitement filled our bodies like lightning! It seemed like an eternity for the rider to make his way across the last few miles to our location. We received the Mochilla at 3:15 am, 15 minutes ahead of schedule, relieving the tired paint horse and rider we had watched come across the desert. Cassidy started out on Costa riding the first 3 miles then Stephanie on Cruzer rode the next 3, and I did the next riding Louie. We planned to continue to run 3 mile sections for our 32 miles of trail headed for Fort Churchill. The darkness was broken by a ¾ moon high in the southern sky. It was enough for the horses to navigate well through the night. The temperature was cool but not cold, and the recent rain had knocked down some of the dust. The first half of the ride was fairly rocky, but we still made good time. Riding at a trot to canter speed at night is thrilling! I put a lot of faith in Louie as we made our way through the darkness. I trusted he could see better than I and would pick his trail, finding the best footing. His long efficient stride shows his Thoroughbred blood, and he seemed to know what was expected of him. He did kick out at a bush on the first leg, but I told him not to worry, and we didn’t look back to see what it was. We had two trucks with horse trailers, driving 3 miles ahead of the rider on the trail, then stopping to unload the next horse, leaving them saddled while in the trailer. We exchanged the mochilla at each stop, loaded the horse that had just run, allowing him to rest in the trailer for the next 6 miles. Since the rider had gone ahead of the trucks, we had to overtake and pass her, and proceed ahead to the next stop, to get ready for the next exchange. 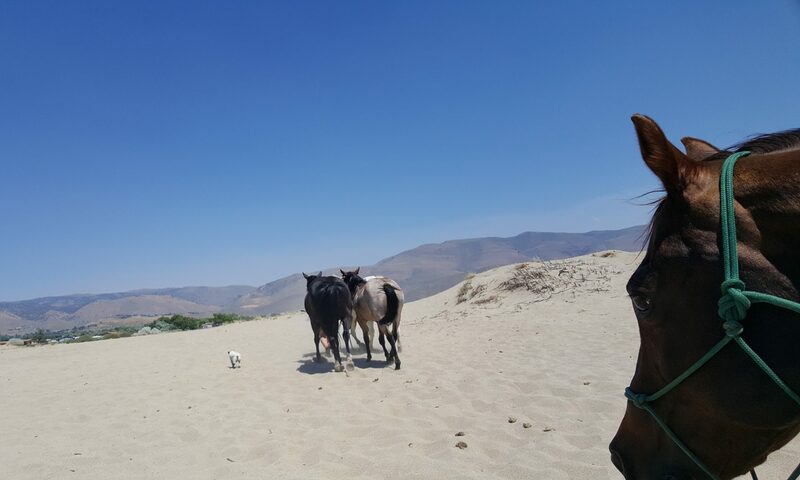 We had decided ahead of time that our horses could easily handle the 3 mile sections, and it gave us enough time to get ahead of the rider for the next exchange. The terrain was open sagebrush and treeless, and the road was graded with high berms on each side, so there was no passing for the trucks and trailers. We kept both trucks close together so we were all in the same place to assist with each exchange. Once we crested the low ridge at about 5:30 am we felt the sun warming our backs as it peeked over the horizon. The desert morning was beautiful, I even noticed flowers on the slopes as I rode down the hill into the valley. Far out into the distance with about 14 miles to go we could see the trees along the Carson river, and ultimately Fort Churchill. As we crossed the playa, the rocky terrain was behind us and we maintained an easy gallop for most of the rest of the distance. Cassidy had no problems crossing the Carson River bridge on Highway 95A, her big Warmblood Costa steady as ever. We used the rigs ahead and behind her to slow the road traffic on the bridge. The muddy water was still raging from the record rains we had this winter and spring. Once across the bridge, she turned for the last mile and came in strong to Ft Churchill at 7:02 am, 43 minutes ahead of schedule. Rachel and Rene were ready to take the Mochilla on the next section towards Carson City. We had arrived so early that no one else was there to see us arrive. We felt satisfied we had done our job well, riding faster than our expected time. None of us had ever ridden a night ride with the Pony Express, and we did it on our own without any help from the more experienced riders. We headed down the road to Dayton, where we unsaddled, fed and watered the horses, and cheered the rest of our team into downtown Carson City.